A technician tests a device for the Apollo missions in the Electronic Research Center (ERC). No, this is not a biological disaster in the making. 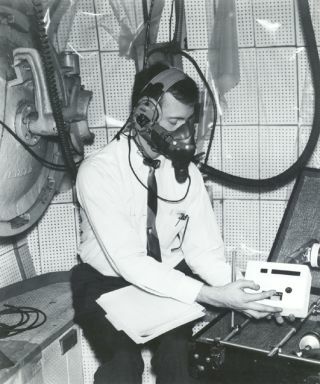 In this historical photo from the U.S. space agency, a technician tests a device that was flown on the Apollo missions to measure cabin particles. The test was done at NASA's Electronics Research Center (ERC). Never heard of the Electronics Research Center? That might be because it closed down long ago. The ERC was located in Cambridge, MA, across the street from MIT at Kendall Square (formerly Technology Square). Although the only NASA Center ever closed, the ERC actually grew while NASA eliminated major programs and cut staff in other areas. Between 1967 and 1970, NASA cut permanent civil service workers at all Centers with one exception, the ERC, whose personnel grew annually until its closure in June 1970.